The Environmental Protection Agency (EPA) WaterSense Program, initiated in 2006, has had a major role in promoting water efficiency nationwide through partnerships with communities, homebuilders, plumbing manufacturers, retailers, and distributors. The EPA WaterSense program is credited with saving 1.5 trillion gallons of water to date. The EPA WaterSense program has two major programs: (1) WaterSense labeled plumbing fixtures and appliances, which must meet strict performance and efficiency standards; and (2) the New Home WaterSense Certification Program, which is gaining in popularity due, in part, to the support of innovative homebuilders. Homes that are built according to the WaterSense New Home Specifications can receive WaterSense certification. 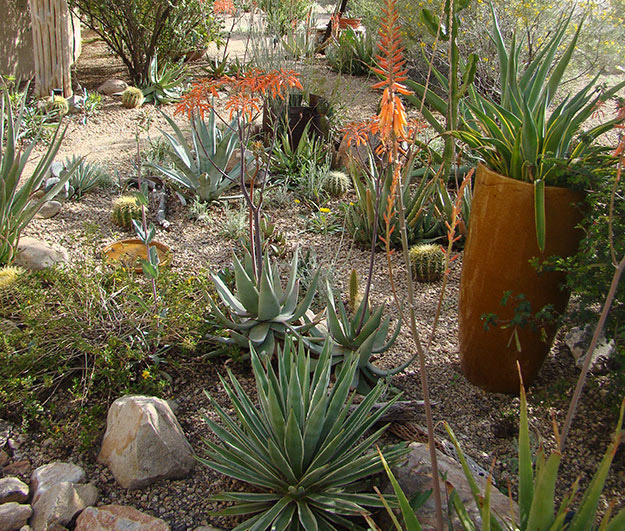 The EPA WaterSense New Home program encourages the use of low water consumption features, including Xeriscape landscaping. Photo Credit: US EPA. The New Home Specifications include highly efficient plumbing fixtures, appliances, hot water on demand, and landscape efficiency features and are updated regularly as new technology is evaluated. EPA’s WaterSense program offers a national label for water efficient new homes that helps homebuyers identify houses that save water, energy, and money through reduced utility bills. The EPA also offers a number of resources to builders to promote and sell WaterSense labeled homes. WaterSense labeled new homes must be independently certified by a licensed certification provider, who oversees a onetime inspection. WaterSense licensed certification providers are identified for each state on the WaterSense website. In 2015, approximately 250 homes were independently certified as WaterSense, In Arizona, there may be only a single WaterSense certified home, located in Sierra Vista. However, there are several WaterSense certified builder partners in Arizona, including Dorn Homes, Mandalay Homes, and Meritage Homes, which offer an opportunity to build more houses in Arizona that meet the certification standards. KB Home is a leading WaterSense homebuilder in the West. It offers a good example of how water conservation features can be widely incorporated into new development and how WaterSense certified homes can be built and marketed. The company included WaterSense labeled products in the more than 8,000 homes it built in 2015, and is building WaterSense certified communities in several locations in the West. It estimates that its efforts have saved 3 million gallons of water a day compared to typical existing homes. The first WaterSense community was Springwood in Roseville, California near Sacramento, with an additional three others being developed. Among the conservation features are WaterSense certified plumbing fixtures and appliances, on demand hot water distribution systems, and water efficient landscaping with irrigation controllers. Although not all the homes they build are certified, all homes include WaterSense fixtures and Energy Star certified dishwashers, which also are water efficient. The company offers additional water-efficient options through its “Home Design Studio,” including opportunities to include alternative water conserving fixtures and appliances into the new home design. KB Home has recently made additional progress in water conservation by incorporating advanced on-site graywater recycling system in each home in a San Diego development. These systems will collect, treat, and reuse water from bathtubs, sinks, and washing machines for irrigation. Water use is projected to be 70% less than that used by conventional homes. In addition, it has built a “Double ZeroHouse” that is designed both to achieve net-zero energy status and to use zero freshwater for irrigation by recycling graywater. More information about the EPA WaterSense Program can be found here. Information about KB Home with links to WaterSense homes and other water conservation efforts can be found here. Information about Mandalay Homes Green Building effort can be found here.